Oh, my swooning heart! This book was so sweet and romantic. I swear there were butterflies in my belly the entire time. 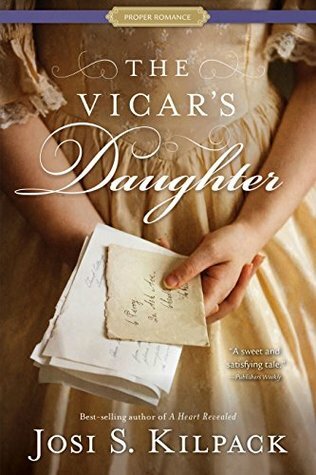 The Vicar’s Daughter had a very “Emma” feel to it, but with a twist. Cassie hated the rules her parent’s instilled that only one daughter at a time would be put in society. So in order to speed things along she tries to help her very anxious sister in making a match. But as things began to progress, she starts to get feelings for the man she wanted for her sister. She tried to put her them aside but when push comes to shove, her heart can’t take the pain. Mr. Glenside is new to society so he’s learning the ins and outs and soon finds himself caught up in a situation that had only one outcome. But in order to be true to his heart he must make the unfortunate decision and cause himself lots of trouble and gossip to be flung his way. Not exactly how he wanted to come out in society, but some things can’t be helped. I loved Cassie. Her heart was in the right place, but her execution was flawed. Royally flawed It’s was very hard to see her suffer. But as a vicar’s daughter there was no escaping it. SHe was well known,therefore people were going to know what happened. She had me in tears towards the end. Gah!! My heart was invested and was wishing for no more suffering. As I’ve said before, I love this Proper Romance series. This one had more religious tones than the many of them. Since it was about a vicar’s family, I’m not surprised. If you love historical romances with all feels, then I recommend you grab this one.